Ah, yes. 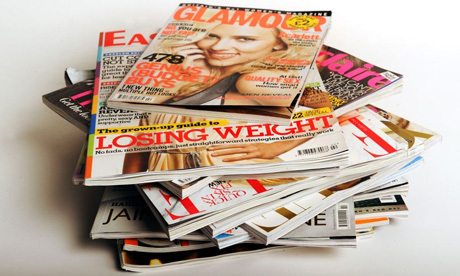 Pick up any of these magazines and instantly find out how to look better, gain intelligence, be healthier, and become the best hostess and friend ever. Oy. Some day, after I’ve either convinced that sneaky Leprechaun to give me his pot of gold, or I’ve met a successful publisher who wants to see the light, I have faith that I can start a magazine based on what we really want, or need, to share. As I’ve said before, I believe it would be so refreshing to have a truthful, honest look at Real Women and topics we can actually relate to. We’ve all seen the before & after images of expensive creams and lotions that will take years off your life. Am I the only one who can’t tell the difference between the photos? Wrinkles happen. Don’t waste hundreds of dollars on the next miracle goo. Put the money instead towards a great hair cut or color; something someone really will notice. As a girl, I used to giggle when my mom would cross her legs before she sneezed. Now I get it. And I hate it. Gone are the days of freedom around belly laughs, sneezing, coughing or even exercising. Let’s vent. Is it some sort of Murphy’s law that you’ll find the perfect outfit on the rack only to determine your size is not there? You then must convince yourself you don’t want it, or try to find it at another store, or attempt to wrestle it off the mannequin since the headless girl is wearing your size. I have unscientific recent proof that when one tries to undress a mannequin, the results can be similar to getting oneself stuck in a size too small in the dressing room. However, mannequins have removeable arms. How handy. Yet store associates apparently frown upon customers taking this initiative. Who knew. Having a crappy day? You officially have 24 hours to wallow in self-pity and misery. We all need this sometimes. Then pull up your big girl pants and move on. When the temperature is in the 90’s and the humidity is over 70%, there is not enough hair product in the world to provide you with a good hair day for more than 20 minutes. Don’t fight it. Embrace the frizz. The remarkable transformation from being young and smart to reaching that point where in the distance between the recipe on your kitchen counter and the refrigerator, you forget what the ingredient is that you need. Don’t worry, you’ll remember it after you go into the other room and forget why. You are over 40. You’ve had children. No amount of exercise will ever give you the perfectly flat abdomen of a teenager. Say goodbye to the bikini, and make friends with your muffin top. Enough with the “50 is the New 40” thing. Because you can only go so far with that. You could look great in your 40’s, but you’ll never again look like you are 20. The best you can do is to look your age and not 20 years older. Be proud of that. Don’t attempt to be Martha Stewart. She has gobs of money and a staff to arrange her parties. With the right snacks, yummy drinks and the perfect blend of BFF’s, no one is going to care that your paper plates don’t match. Real Women. Real life. On newstands some day. Have faith and carry on – we all Rock. This entry was posted in beauty, real style, real women, Style and tagged articles, beauty, Reality, style, women's magazines. Bookmark the permalink.